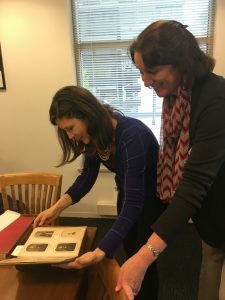 Librarian Anne Evenhaugen and Cristina Price perusing a carte de visite album. On a rainy April morning, Smithsonian Libraries Advisory Board member Amy Threefoot Valeiras and her family visited the American Art and Portrait Gallery Library (AA/PG). What they found surprised everyone! Anne Evenhaugen and Alexandra Reigle, staff at the AA/PG Library, selected a variety of books and artists’ books to show our visitors. One of these was a carte de visite book, featuring photographic trading cards for nineteenth-century American painters. (What is a carte de visite, you ask? Click here to learn more!) After a few turns of the page, Amy’s sister-in-law, Cristina Price, stumbled upon a familiar face and name: her own distant relative W.T. Richards!